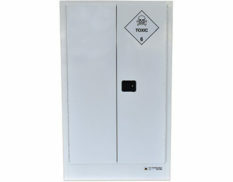 Store Class 6 toxic substances securely in these lockable safety cabinets, available in a variety of sizes. 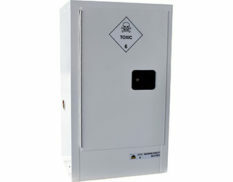 Toxic safety storage cabinets have been designed to comply with AS4452-1997 – the storage and handling of toxic substances. 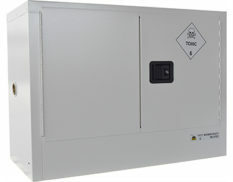 Toxic safety cabinets feature self-closing doors and integral vents with flash arrestors to prevent the chase of vapour ignition. Made right here in Australia, our toxic safety cabinets are displayed below according to their storage capacity, from smallest to largest. If the size you require is not listed below, please contact us to discuss your needs. Our local manufacturing factory has the ability to quickly and easily produce custom-made bespoke products on demand. 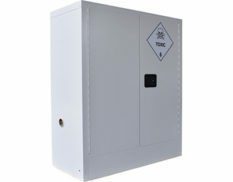 Store up to 60 litres in this Class 6 toxic safety storage cabinet. 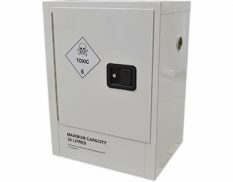 Safely store up to 100 litres in this Class 6 toxic storage cabinet.